A father-of-four believes that wearing a ‘revolutionary’ headset has transformed his life and helped him gain a six-pack. Chris Barry, from Springfield, Illinois, ditched 1st 2lbs (7.3kg) after using the Modius device – which suppresses appetite by zapping the brain. 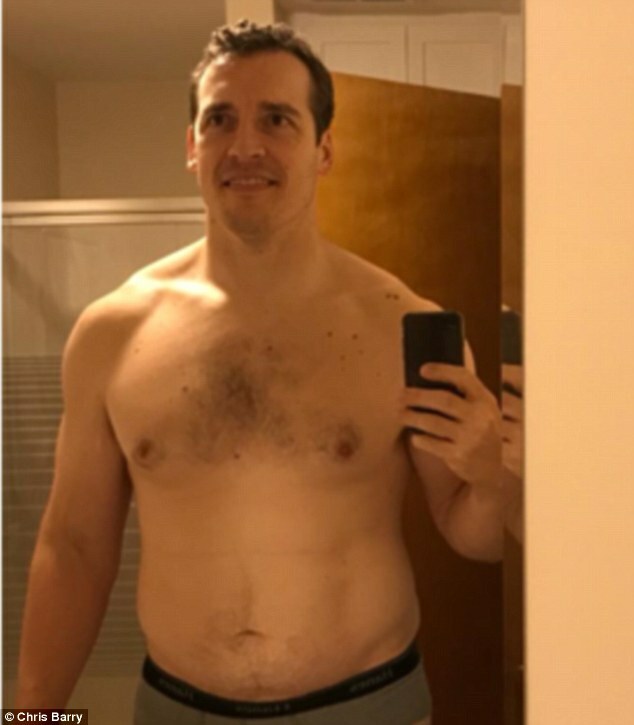 Stunning pictures show the results the cutting-edge gadget has had on the admin worker, going from a typical dad-bod to being toned. Mr Barry, a 36-year-old former American football player, weighed 18st 4lbs (116kg) before he began using Modius for an hour each night. And in just 10 weeks, without changing his lifestyle, he dropped to 17st 2lbs (108kg) and helped him lose two inches from around his waist. Modius was on show at this year’s Mobile World Congress in Barcelona last week. The tech summit is the world’s largest gathering of its kind. Dr Jason McKeown, co-inventor of Modius, achieved dramatic results after using the gadget. He told MailOnline: ‘This device is revolutionary. Speaking to MailOnline about his weight loss results, Mr Barry explained how the pioneering device has left him feeling ’empowered’. He said: ‘Modius has transformed by life by helping me be consistent in not just one area that improves health, but pretty much all areas. ‘I have adopted a better sleep habit because Modius helps me feel sleepy earlier and stay asleep longer. ‘It helps me have fewer cravings for unhealthy foods and stick to foods that are aligned to my goals as far as health and aesthetics are concerned. Mr Barry, who has four daughters called Faith, Lydia, Evelyn and Gwen, added: ‘It helps me want to move more and even focus a bit better. Created by neuroscientists at the University of California San Diego, Modius works by stimulating the area of the brain that controls fat storage, called the hypothalamus. It does this by sending low-level electrical pulses to the vestibular nerve, located close to the skin’s surface behind the ear. The stimulation is interpreted by the brain as the body being more physically active, triggering the hypothalamus to reduce fat storage. It does this using several mechanisms – increasing fat-burning, decreasing appetite and activating metabolic hormones. Mr Barry, who has been happily married for 10 years, also revealed how he has had other women comment on how lean he looks. But he added that his wife, Bethany, who he is devoted to, is ‘extremely happy’ with his incredible transformation, which he began in November. While using Modius, Mr Barry maintained his usual exercise regime of weightlifting three days a week and doing some cardio twice a week. However, he admitted he started tracking his calories and macros – and adjusted his diet to incorporate more protein and less fat. Created by neuroscientists at the University of California San Diego, it works by stimulating the area of the brain that controls fat storage, called the hypothalamus. WHAT WAS MR BARRY’S REGIME BEFORE MODIUS? BEFORE: Before using the Modius device, Mr Barry never use to track his calories or macros. He also weight-lifted three days a week and performed cardio-based exercises at least twice a week. 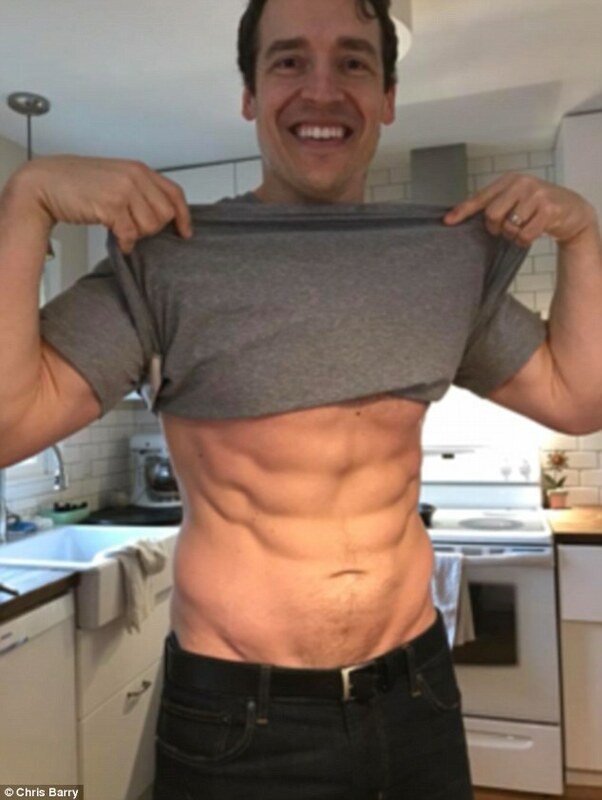 DURING: While using Modius, Mr Barry revolutionised his diet by tracking his calories and macros – and adjusted his diet to incorporate more protein and less fat. He maintained his exercise regime. 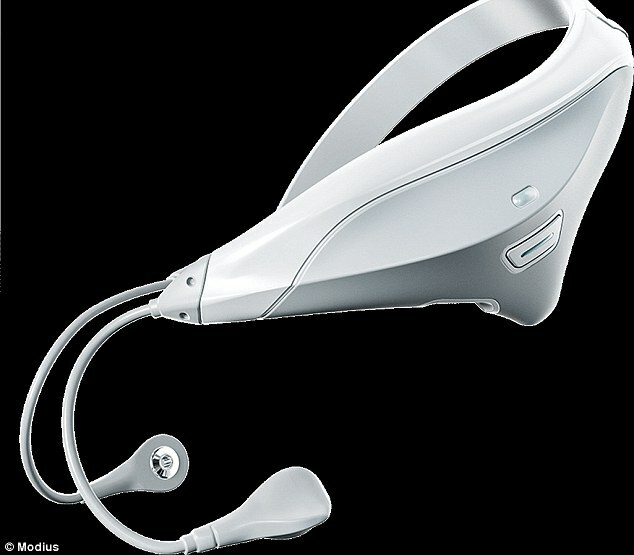 The headset, which costs £369 ($508) is controlled by a smartphone app which allows users to change how strong the stimulations they receive are. As part of a safety feature, it is automatically programmed to stop if it is used for any longer than 60 minutes within a 24-hour period. However, its manufacturers are adamant that an hour is all that is needed to achieve dramatic results, if used daily for at least 10 weeks. Neurovalens, the company behind the product, tested the device out on users over a 16-week period, for an average of three hours use per week. The average reduction in central body fat was 8 per cent. These studies were carried out without changes in either diet or exercise. Dr McKeown claims it reduced his body fat by 44 per cent when it was worn daily for 12 months. The product was launched on Indiegogo by Neurovalens – dual headquartered in California and Belfast. They secured almost £1.5 million in funding.